Selling digital items on Etsy is a great way to diversify your product selection and increase sales. If you sell tangible goods on Etsy, digital patterns and tutorials can make a great addition to your shop. For digital artists and photographers, Etsy can be a great venue for your products. CraftHub.me has made selling digital items on Etsy virtually hands free. CraftHub.me allows your customers to download their purchases instantly. For you, CraftHub.me provides automated delivery and can even re-list your items when they sell. Over the next three posts, I will guide you through the process of preparing digital content, setting up your Etsy shop, and connecting it to CraftHub.me. I will use my own recently created digital Etsy shop, Conteximus, as an example. In this post, Preparing Your Content, I will cover important considerations for creating your content, preparing your files, and protecting your digital content. Your content could be an image (such as a digital photograph or graphic) or information (such as a pattern, tutorial or ebook). Both kinds of content should be created with your customer in mind. How will they use this item? What do I NOT want customers to do with this product? The answers to these questions will depend on your product. They will also help you determine how to prepare your file. I answered these questions for my own shop below. My Etsy shop sells nature themed digital art. My target customers are individuals, educators, nonprofit organizations and small businesses. They will use my products in small scale print and digital projects such as scrapbooks, educational materials, newsletters and websites. I do NOT want my customers to re-sell my products or use them for commercial production. It is important to understand your customer's needs when preparing your file. The type and size of your file will effect how it can be used. If you are selling graphic files, then you must also consider the image dimensions and resolution of your files. Is my file primarily text or images? Will my customer need to print this file? If so, how large will they print it? Will my customers need help figuring out how to use my files? Does my customer need a specific software or technical knowledge to use this file? Your answers to these questions will affect how you prepare your file. I have answered these questions for my shop below. My files are primarily graphic. Some of my customers will need to print my files. Others will use them online. I will prepare my files for both uses. Some of my customers may not feel comfortable with preparing images for production. I will distribute files in a user friendly format. My customers will not need a specific program to open my files. I will save my images in a common format so that they can be easily used with any program that supports images. The file type determines how information is organized within the file. Different file types have different advantages, so it is important to choose the right file type for your purpose. You can tell what format a file is in by look at its extension. The extension is the part of the file name that comes after the dot. If my file is named EXAMPLE.JPG, then JPG is the file extension. Computer programs usually have a default file type. For example, Microsoft Word uses the format .DOCX. However, most programs give you the option to save in a variety of formats, so you can choose the one that best fits your needs. Not every computer program can open every file type. Some file types are common and can be opened by many programs. Others may require a specific program. To maximize the number of customers that can use your product, use a common file type, such as JPG, PNG, or PDF. If your product is targeted toward a specific group, such as Adobe Photoshop users, it makes sense to offer your file in the format that best suits their needs. If you are unsure what file type is best for you, find a vendor selling similar products and ask what format they use. I will offer my images in both JPG and PNG formats. 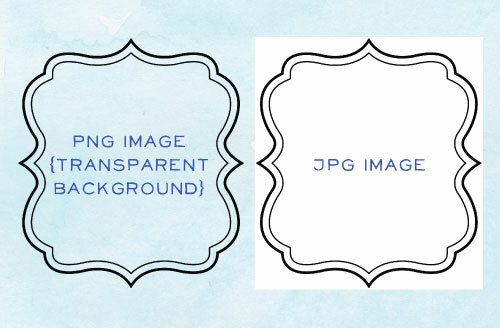 JPG images are the most common type of image that most of your customers will be familiar with. 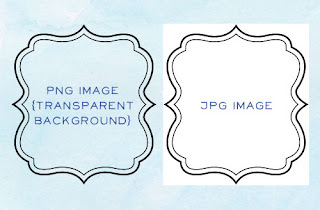 A PNG file allows me to save my images with a transparent background. This will be useful for my customers who want to layer my images onto their own documents and photos. File size is measured in bytes. A byte (B) is a unit of digital information. The more information your file contains, the larger it will be. Bigger is not always better when it comes to file size. Large files can take a long time to download and open, they load slowly on webpages, and many email providers limit the size of file attachments. CraftHub.me hosts files up to 50 Megabytes (MB), but for most uses a smaller size is better. If your customer is printing a postcard, they won't need an image scaled for a billboard. 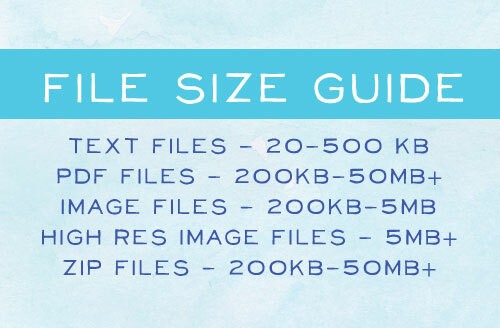 Your file size will depend on what it contains, but here is a quick guide for an estimating an appropriate size range for your file. 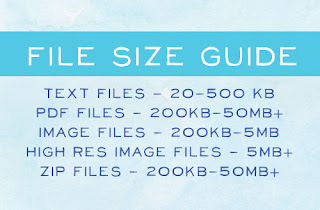 If you are working with images, the dimensions and resolution of your images will contribute to your file size. Digital files are measured in pixels. The resolution of an image is determined by the number of pixels per inch (ppi or dpi). The quality of an image depends on the number of pixels it contains and the scale at which it is shown. For example, an image 50 x 50 pixels wide shown at 1 x 1 inch has a resolution of 50 ppi. However, the same image shown at 5 x 5 inches has a resolution of 10 ppi. For a quality print, your image resolution should be between 180 and 360 ppi. The standard resolution for web images is 72 ppi. I have decided to size my images at 1500x1500 pixels. This will allow my customers to print a high quality image up to 8 inches, a size that can be printed on most printers. Creating zip files is a great way to limit the number of files that your customers have to download. A zip file is a file format that is used for compression and archiving. Each individual file can contain many images or files. For example, if you have a digital paper pack that contains 10 images. Instead of sending each file individually they can be combined into a single zip. You can read details about creating a zip file here. Check back soon for part two of this guide, Setting up Your Etsy Shop.